Malaria is the most prevalent infectious disease, and kills half a million individuals a year, mostly children under the age of five. Despite significant reductions in morbidity and mortality rates in the past decade and a half, malaria remains a significant global health problem. Half the world’s population remains at risk of infection, and in 2016, there was an estimated 216 million recorded incidences. In humans, the disease is caused by five Plasmodium species: P. falciparum, P. vivax, P. malariae, P. ovale, and P. knowlesi. The Plasmodium parasite has a complex lifecycle and requires both a human and mosquito host. A three-pronged strategy is used to combat malaria: 1) parasite control using antimalarial drugs, 2) vector control via insecticides and mosquito sterility, and 3) physical barriers such as mosquito nets. There are no vaccines currently available. Plasmodium lifecycle. Plasmodium parasites are transmitted via female Anopheles mosquitoes. When the mosquito takes a bloodmeal, she releases anti-coagulatory factors along with sporozoites from her salivary glands. The sporozoites make their way to the liver, where they establish a liver stage infection and multiply. Eventually, released merozoites infect red blood cells (RBC), establishing the asexual blood stages (ABS). Here, the immature ring stages progress to mature trophozoites, distinctive for containing hemozoin, and eventually to the schizont stages before they segment into merozoites that are released to invade fresh RBC. Most P. falciparum strains have close to a 48-hour ABS cycle, and the synchronous release of new merozoites into the bloodstream is responsible for the characteristic malaria symptoms of alternate fevers and chills. Some ring-stage parasites commit to sexual differentiation, forming female and male gametocytes. 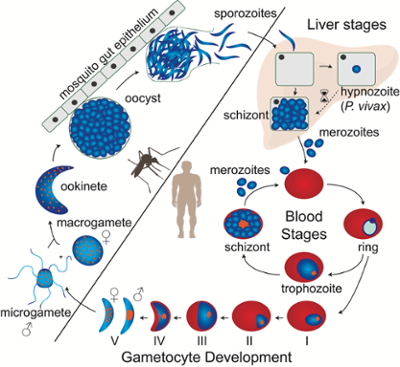 The gametes sexually combine to form the ookinete, developing into oocysts in the mosquito midgut and eventually differentiating into sporozoites that migrate to the salivary glands, ready to be transmitted to another human being via the mosquito’s next bite. Image courtesy of Manu Vanaerschot. Plasmodium species and strains tend to cluster geographically. In Africa, the major parasite is P. falciparum, whereas there is a mix of both P. falciparum and P. vivax in Southeast Asia and South America. Most antimalarial drugs target the asexual blood stages, which is the stage that produces clinical symptoms. A reduction in the parasite burden during these stages results in alleviation of clinical symptoms. The World Health Organization currently recommends artemisinin-based combination therapies (ACTs) for acute falciparum malaria. Alarmingly, resistance has arisen to all clinical antimalarials, including the artemisinins. Due to a combination of factors including the number of concurrent infections, immunity, and access to healthcare, Southeast Asia has emerged as a hotspot for antimalarial drug resistance, and from there resistance has spread to both Africa and South America. If artemisinin resistance follows the trajectory of chloroquine resistance, millions are at risk of death. The Ng lab is interested in understanding the genetics and molecular mechanisms underlying antimalarial drug resistance, as well as discovering novel therapeutic targets and/or pathways. In particular, we are interested in how ubiquitin, the ubiquitin-proteasome system, and other degradative systems affect parasite drug responses and malaria pathogenesis. White, N.J. (2008). Qinghaosu (artemisinin): the price of success. Science 320: 330-4. Paloque, L., et al. (2016). Plasmodium falciparum: multifaceted resistance to artemisinins. Malar J 15: 149. Tilley, L. et al. (2016). Artemisinin action and resistance in Plasmodium falciparum. Trends Parasitol 32: 682-96. Ng, C.L., et al. (2017). Protein degradation systems as antimalarial therapeutic targets. Trends Parasitol 33: 731-743.